Sorry to be a bit late on this, but we were away over the weekend and have been under the weather since..
Soupy Sales, the rubber-faced comedian who made pie throwing into an art form, passed away last Thursday at the age of 83 after a long illness..
Born Milton Supman in Franklinton, North Carolina, Sales' family moved to Huntington, West Virginia..After graduating from Marshall College, he worked at WHTN radio in Huntington, then moved to Cincinnati in 1949 hosting one of the nation's earliest dance shows on WKRC-TV..
After being fired from WKRC, Sales headed to Cleveland, where about 1952-53 he worked at WXEL-9 hosting an afternoon show, Soupy's On..The following are some remembrances from former historic FOX 8 web pages, which are no longer on their website..The complete archive is in our links..
"Bob Soinski: Soupy Sales also started here, only back then he was known as Soupy Hines. He wound up changing his name because he didn't want to be linked to Hines ketchup. Soupy Sales: Her name was Patty Rowe. She was a piano player. We did "Soup's On" for about a year and won the Plain Dealer Award for best new TV show. The station took it off the air the next day, and I headed to Detroit." 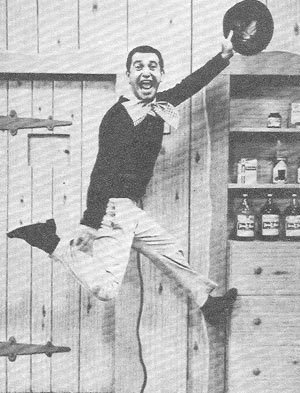 Soupy became a hit at WXYZ-7 hosting "Lunch With Soupy Sales" and an 11PM show..
Soupy later appeared on ABC Network and Local Shows in Los Angeles and by 1964 moved to New York to host local shows.By the 1970's he was appearing on the syndicated "What's My Line?" 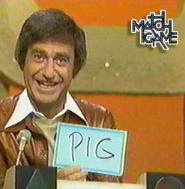 and other Game Shows...After a 1978 syndicated TV effort, Sales was host of WNBC Radio's afternoon show (1985-87)..One of his later TV appearances was in 1997 on the "Woodrow The Woodsman" revival series aired over WJW-TV Fox 8..Sort of coming full circle from his early Cleveland days..
Our prayers are with the family..Soupy had a rich, full career and was much loved by his fans.. Portion of a 1965 Soupy Sales Show.. 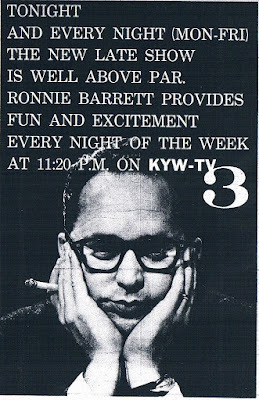 I thought this morning we would feature a couple of videos from my YouTube page with classic WEWS-TV 5 local programs..
Music programming on Channel 5..Featuring Upbeat, The Gene Carroll Show and Polka Varieties.. These are taken from the WEWS 50th anniversary program December 17, 1997..Recently retired TV 5 News Anchor Ted Henry is the narrator.. I'd like to at some point find some more to upload soon..Though it does take a lot of time and effort..I will start working on some more as soon as I can..
Two new clips from "Turn Blue" The PBS special about the Ghoulardi Legacy to air next week..
Chuck Schodowski talks about his start in TV..
Outtake:Big Chuck talks about his first skit with Ernie Anderson-"The Batting Coach"
My wife and I will be at the Ghoulardifest this Friday Night and all day Saturday ...We'll try to bring pictures and a report next week or in early November..Also, with the holidays coming up,as is our tradition..we will try to find Thankgiving/Christmas TV schedules, ads and video, etc..To feature..Also this year..We have 2 new Christmas TV-Themed books that we will be reviewing..As always, I appreciate all who stop by..Thanks.. 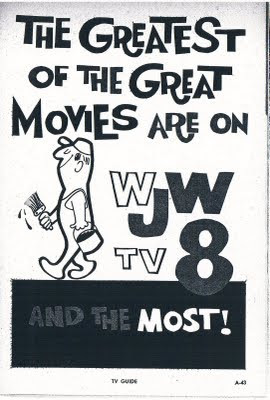 were about to retire their show from Fox 8:My thoughts at the time about their retirement and my memories about the 44 year Movie host tradition at WJW-TV . 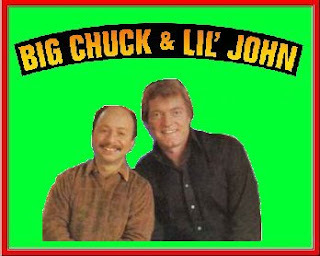 A lot has happened since 2007..Big Chuck and Lil John have hardly "retired"..They still do personal appearances..And headline the "Ghoulardifest", which is coming up a week from today..Several new DVD collections have come out with more on the way..Big Chuck , with Tom Feran released his biography last year with a Paperback version (including a new chapter) being released shortly..The legacy does continue.. Personal note:One of my dear friends online WIXYGrad74, is featuring yours truly and Cleveland Classic Media on his blog today..Thanks WIXY! !..You're one of the good ones.. Sort of a fun ad for TV 8 movies.. 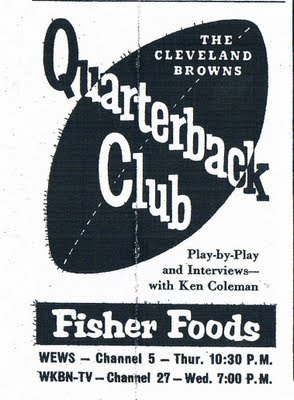 In The Style of Dateline Hollywood and New York Columns..TV Guide goes over some of the Local changes in the fall..Click to read more clearly..
WEWS-TV/WKBN/Fisher Foods' Ad for Ken Coleman's "Quarterback Club"
Double page spread with two ads..A Jerome Kern Special and Fibber McGee and Molly, In Their second week..
Ronnie Barrett, Cleveland Radio DJ..Had hosted Classical Music on KYW-FM in the mid 1950's before becoming part of the first cast on Channel 5's One O Clock Club in 1957..Here, he hosts the 11:20 Movie after the Pete French News.. Note:I copied these pages at the Akron Downtown Library months ago..Looking at the above ad many times I just now got the pun.."The Late Night Show is well above Pa(a)r"..I can be so dense sometimes!LOL! 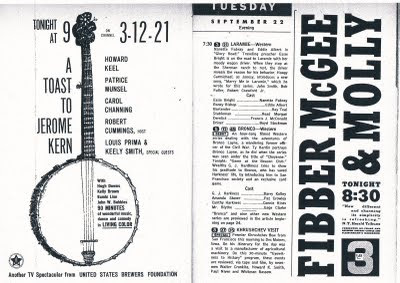 Today, lets look at the Fall TV season of 1959-60..Fifty years ago..TV guide was touting it as the "Year Of The Special" as it were, with 400 specials on Network TV for this season..Amazing, when you consider there were only 3 networks..In those days, when a show was pre-empted for a "Special" it was usually a more different, interesting or exciting program than the normal program in that time period..These days, with 500 or more channels, the lines become blurred as far as a "special program" is comcerned. As far as series programming, the Western reigned supreme, with a total of 29, including 10 new shows. The only Western of this group to last a long time was "Bonanza" which aired for 12 and a half seasons on NBC..Though Laramie on the same Network lasted four seasons..
Next were Private Eyes, mostly on ABC, with Warner Brothers Shows like Hawaiian Eye and Bourbon Street Beat Making their debuts., as well as The Untouchables. Most of the detective shows of this era were gone by 1963.. 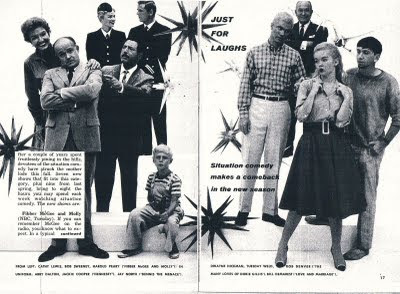 According to TV Guide, the Situation Comedy was making a comeback, However, of the seven new sitcoms, only 3 lasted past 59-60..Dennis The Menace, Dobie Gillis and Henessey..NBC's ill-fated attempt at remaking Fibber McGee and Molly for TV barely lasted past the Holidays.. Locally, Myrus The Mentalist made a comeback on WJW-TV 8 Tuesdays at 8PM..Bozo also premiered this season on Channel 8 with Ed Fisher in The Clown Costume..New Bishop Sheen films were to air on WEWS Channel 5, along with Notre Dame Football Replays and Mike Hammer with Darren McGavin (Incidentally airing on Retro TV Network weekends in 2009)..KYW picked up Brave Stallion (Fury Reruns) in Syndication..
3 Movie-1943 Comedy "Higher and Higher"
8 Movie-TBA-Nikita Khruschev's arrival for a US Visit was scheduled at this time possibly pre-empting programming at this time..
3 Credo-Channel 3 used this title for Interfaith religious sign-on messages into the 1980s..
5-45-49 Who Do You Trust? 3-5-8-21-27-45-49 Khruschev Visit-Reporters/Commentators:NBC-Ray Scherer, Richard Harkness-ABC:John Secondari, Robert Fleming, Charles Ashley-CBS:Walter Cronkite, Howard K. Smith, Paul Niven and Whitman Bassow..
3-21 Who Pays?-Mike Wallace..Panelists-Sir Cedric Hardwicke, Celeste Holm and Gene Klavan.."Bat Masterson" Moves to this time next week. 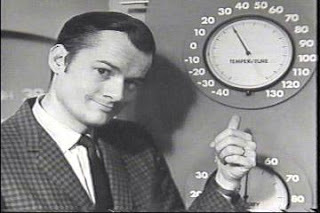 5-45 Zorro-To be replaced by Donna Reed The following week..
Several months back, we announced that Phil Hoffman, Media Professor at Akron University, was producing a new special about Ernie Anderson and The Ghoulardi Phenomenon from 1963-66 in Northeast Ohio.. Here is a short YouTube clip from Mr. Hoffman..Looks to be very well done.. 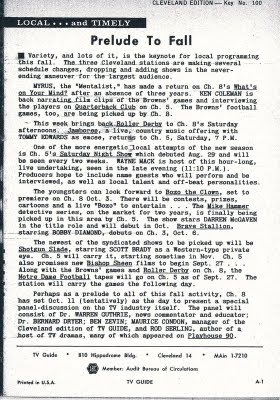 Here, Tom Feran, Ron Garsteck and Mike Olszewski talk about how widespread the Ghoulardi craze was..
A personal note:Phil credits me and Cleveland Classic Media for the use of some material from here in the program..Really appreciate it..